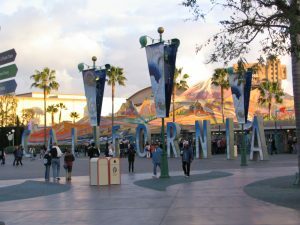 We haven’t really spent much time in California Adventure yet, but I’m going to say a few things about it here anyway. 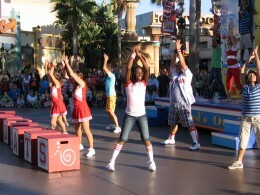 There’s not anything actually wrong with California Adventure. It’s lovely, done with the fanatical attention to detail that is the Disney trademark. The monorail overpass looks like the Golden Gate Bridge, and there is a beautiful mosaic at the entrance plaza. Inside, it’s nice to look at. And yet, almost everyone turns left at the Esplanade, toward Disneyland. If we have any time later, most of them are thinking, we’ll go over there (which often doesn’t work out, as California Adventure often closes at 6, many hours before Disneyland). Or maybe on the second or third day of our vacation. Or maybe not at all. Why is that? Well, that’s the one billion dollar question, isn’t it? That’s how much Disney just announced it expects to spend over the next few years basically rethinking and rebuilding the park from the ground up. Few details of their plans have been made public yet, but it’s an extraordinary confession of failure on the part of a company that’s not used to failure, not in the parks, anyway. The Paris Disneyland was slow to start, but now is very popular … apparently because they figured out a way to get Germans to come. (I could have told them how to do that: Set up a cardboard-and -plaster “Maginot Line” and tell them not to cross it!) Tokyo Disneyland is a smashing success. 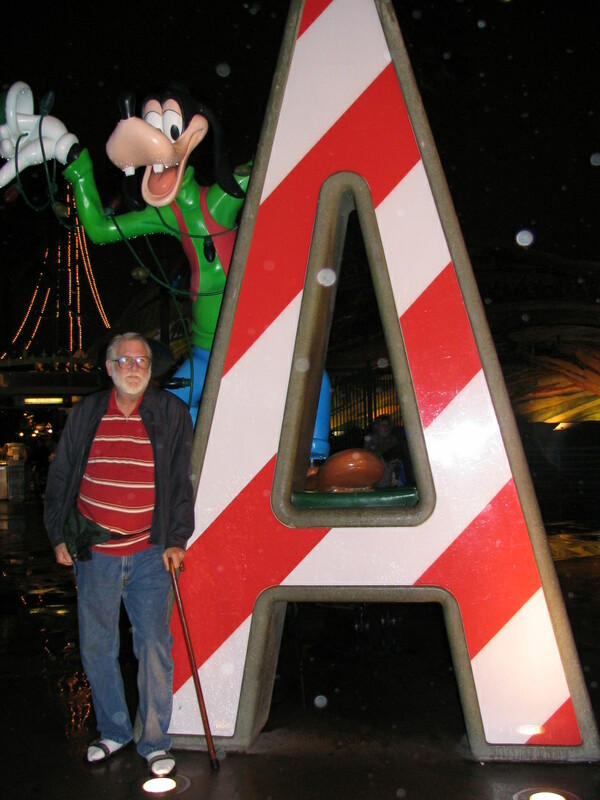 Hong Kong Disneyland is still too new to know. 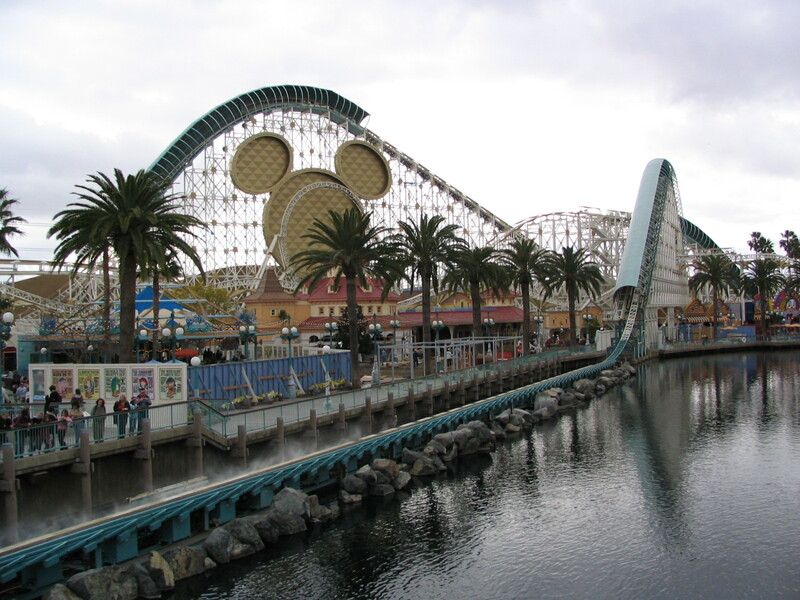 The fact is, you can walk through much of California Adventure and not encounter many crowds, except around the rides that are popular, like the big California Screamin’ Mickey Mouse roller coaster, and the Twilight Zone Tower of Terror, and the Maliboomer. One corner of the place is designed for smaller kids (me being a six-foot-six kid, with a cane), and it does pretty well. 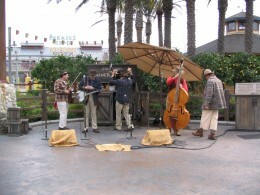 It’s to the north and west of the Paradise Pier themed area. 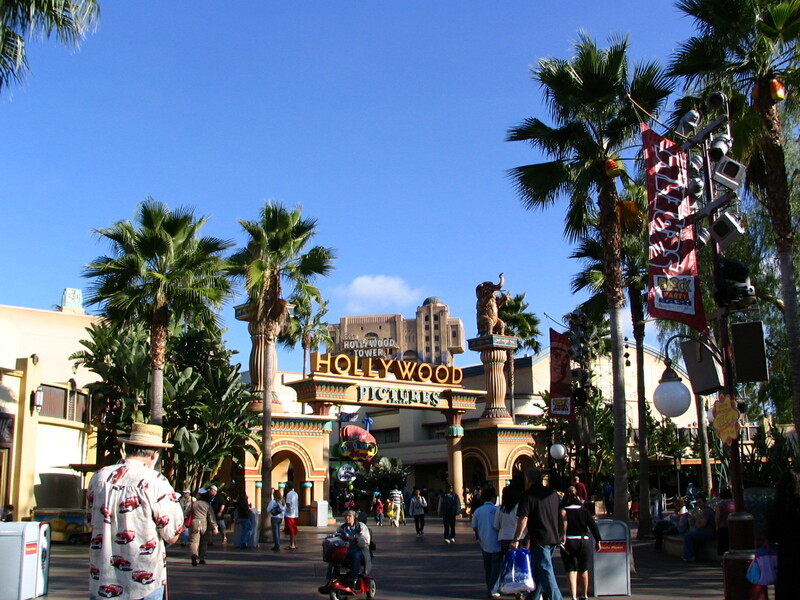 But there is a stretch of California Adventure from the lagoon running through areas themed as Mexico, Wine Country, Central Valley (this is listed on the maps as the Golden State area) and reaching into the Hollywood Pictures Backlot area where if you opened fire with a Gatling gun all you’d be likely to hit would be Goofy and Buzz Lightyear. The day we were there, recently, there was almost no one in evidence, and the only reason those few were there was that they were on their way to or from the Tower of Terror. That’s the only way to get there. And it’s not too surprising. Most of the “attractions” in that area have closed. It’s sort of like a Main Street downtown, after a Wal-Mart has opened at the city limits. The girl selling souvenirs in the kiosk there looked like the loneliest person in the Disney Resort. Magic. There’s not much magic here. There’s not even much Disney. 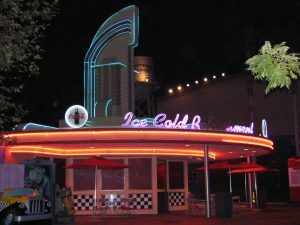 I’m remembering back to the ‘60s, when there was a brief flurry of other projects hoping to cash in on the Disneyland gold mine. This may have been the time when the term “theme park” was coined; before that, there were parks like Coney Island—the exact thing Walt went to great lengths to avoid, with its air of sleaze, sideshows, stale corndogs and gum on the bottom of your shoe—and there was Disneyland. One of these places was Freedomland, in The Bronx. Uhhhh, hello? As far as I know, for a very long time no one has ever gone to Da Bronx but for three reasons: They live there and can’t avoid it, they’re going to the Zoo, or they’re going to Yankee Stadium. (And one day soon they may not even go to see the Yankees, who’ve wanted to move for a long time. For that matter, I’ll bet if you polled the zoo animals, they’d be in favor of relocating to Connecticut, too.) You want to know what a visit to The Bronx is like? Ask Sherman McCoy, from Tom Wolfe’s The Bonfire of the Vanities. Most New Yorkers—and just about 100% of actual Americans—would agree: Don’t go there! So it started out with a big problem, I think. Freedomland had areas themed to New York (hello? Aren’t we already in New York? Oh, Little Old New York, you say? … never mind), Chicago (that’s just what you want to see when you visit New York, isn’t it? Chicago? 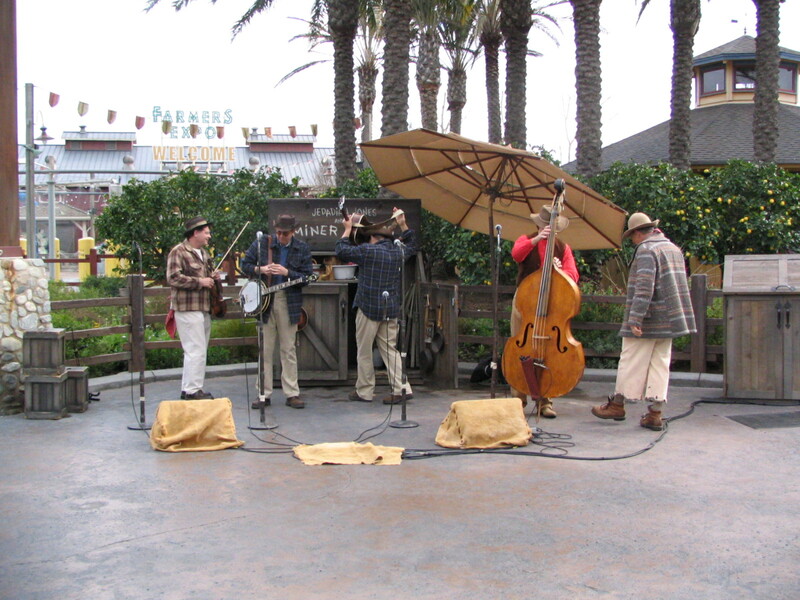 ), The Great Plains, San Francisco, The Old Southwest, New Orleans/ Mardi Gras, State Fair Midway, and their version of Tomorrowland, Satellite City. … and actually, looking at that list, I think I would have liked to have visited Freedomland. Reminiscent of Epcot’s world village, isn’t it? Only All-American. But you know what they say, location, location, yada yada … It lasted just four years and went broke. At the same time some savvier entrepreneurs opened a park between Dallas and Fort Worth, Six Flag Over Texas. Their theme was a little more modest than the continent-spanning dreams of Freedomland: Just the Great State of Texas. (Now that there are “Six Flags” parks all over the country, and the name means little, you may not know that there actually were six flags to fly over my home state: Spain, France, Mexico, The Republic of Texas, the Stars and Stripes, the Confederacy—sorry about that—and the USA again.) I visited that park when I was young and it was new. They had six themed areas, naturally, and a lot of rides. It was clean and well-designed, like Disneyland. Staff were courteous. They may have been the first to fold lines back on themselves instead of letting them stretch out forever, and they did it for a simple reason: They could then put the lines in a semi-enclosed building, and air-condition it. Air-conditioning the outdoors! You can’t imagine how much that idea appealed to Texans at the time! My father was flabbergasted, and fell in love with the place. Made us proud to be Texans! I believe they also originated the flat-fee, all the rides you can eat policy, while Disneyland was still selling A through E ticket books. 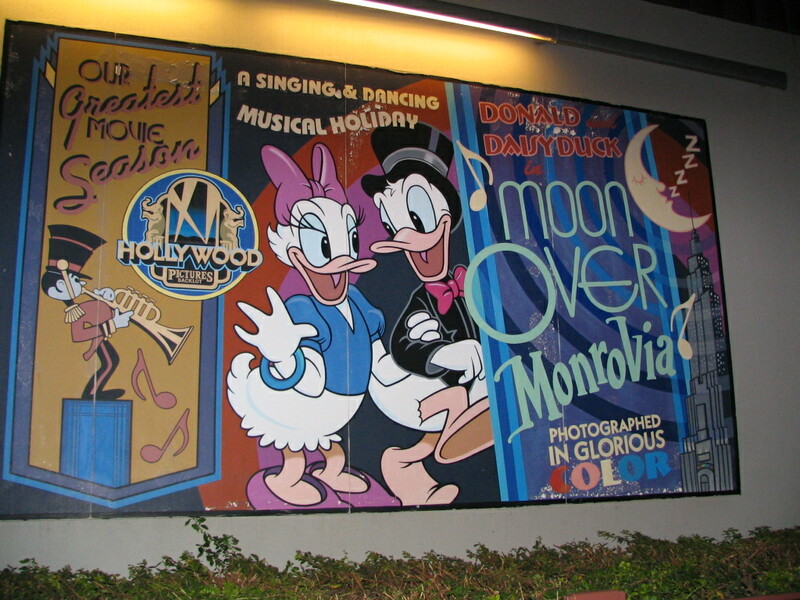 Disneyland eventually copied that. And, yea verily, Texans saw that it was good, and it thrived, and spawned Six Flags Over Georgia (with some flimsy excuse concerning the flags), and many others. Now there are 14 parks with that name, some of them, like Magic Mountain, taken over from other builders, and 12 water parks—many next door to the theme parks—and 2 animal parks. It’s an empire that may be larger than Disney, or at least it rivals it. What was their secret? Well, after the first park, they seem to have downplayed the “theme” part, and concentrated on the thrill rides. The parks are clean and bright and well-built, just like the first one, but they’re nothing like Disney. Magic Mountain now has fourteen roller coasters, each one more scary than the last. They build a new one most every year. 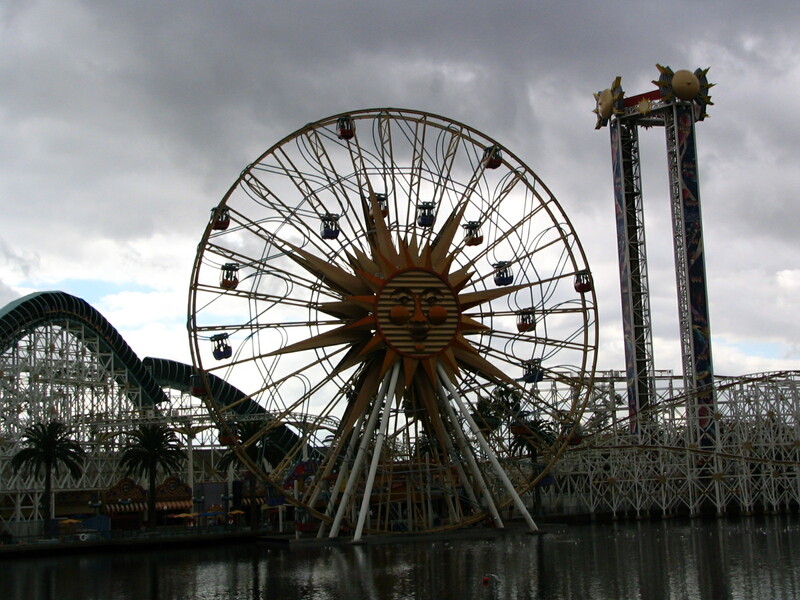 These are rides for teenagers and young adults; there is not much provision for smaller children at Magic Mountain. 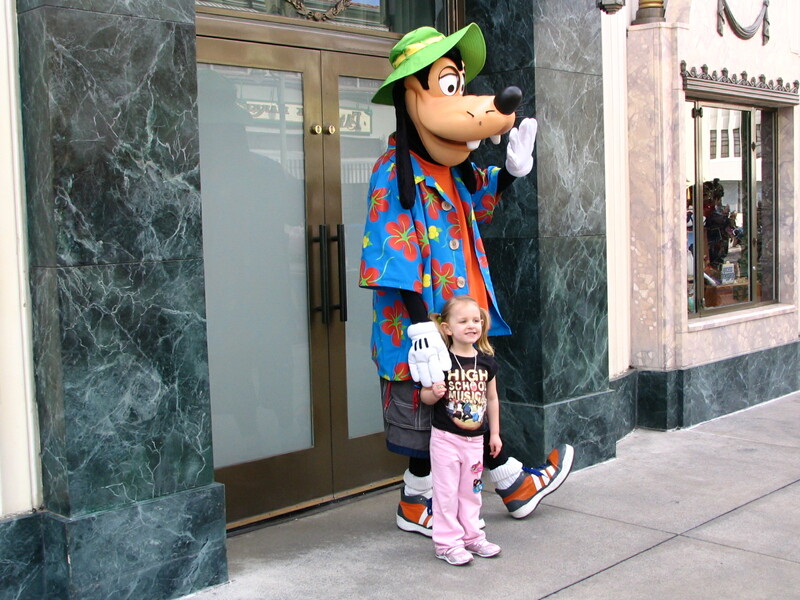 You have small children, you go to Legoland, or Knott’s Berry Farm … which seems to have struck a balance between Magic Mountain thrills and Disney kid stuff. They’re still in business, anyway. 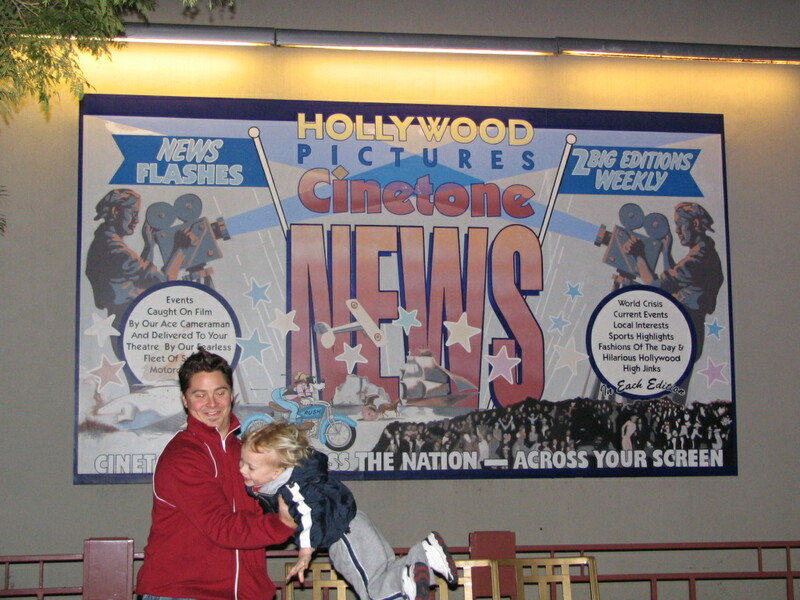 So … Disneyland has never been about spine-chilling thrills. Though it has three coasters, they are pretty tame compared to the head-bashers and gut busters at Magic Mountain. At Disneyland, the ride is not about the drop and the inversions and the hang time, it’s about what you see and hear along the way. California Adventure has California Screamin’, a nothing-special steel rail coaster that I’m sure Magic Mountain frequenters sneer at, and the Twilight Zone Tower of Terror, which I haven’t ridden yet, but looks to be basically a free-fall ride, like the one I first rode at Astroworld in Houston, only spiffed up with Disney trimmings. I’ve concluded that California Adventure doesn’t really know what it is. Sure, it’s California, but that doesn’t seem to have worked out too well. I mean, step outside the park and where are you? Uh … California! 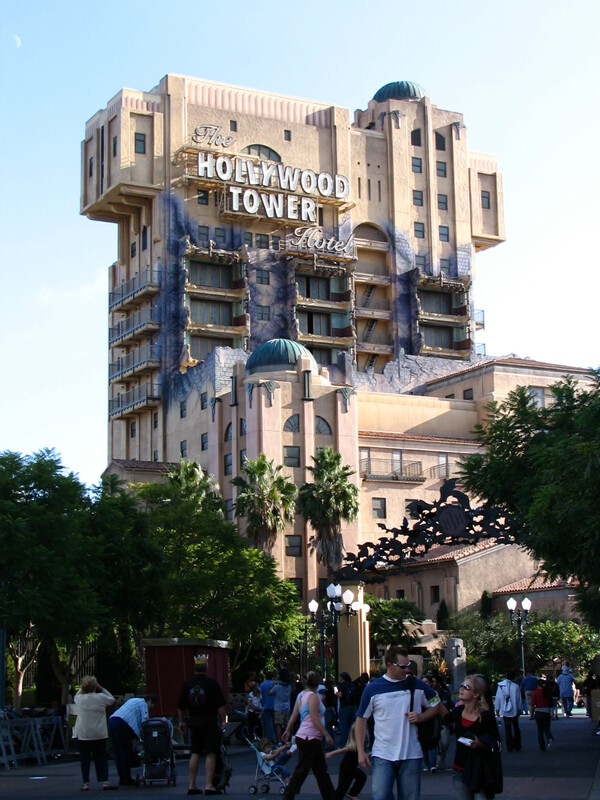 It can’t sell itself on thrill rides; there are only three. And it has not much in the way of Disney Magic. There are various shows based on various animated movies, but they’re Pixar films, mainly, not Walt films, and they seem to be mostly 3D movies or live stage shows. Several of them have opened and closed over the years. Several upscale restaurants have closed, too (bye-bye, Wolfgang Puck, get your Heinie heinie back to Las Vegas where you’re appreciated). In short, nothing much is working well. Maybe more of both, the things don’t have to be mutually exclusive. 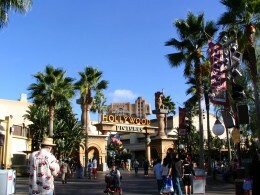 First, I’d trash the whole Hollywood Pictures Backlot area. It’s pretty, and clever … and nobody goes there. I think I’d also trash the whole “California” idea, too. Make it Disney’s Adventure Park. 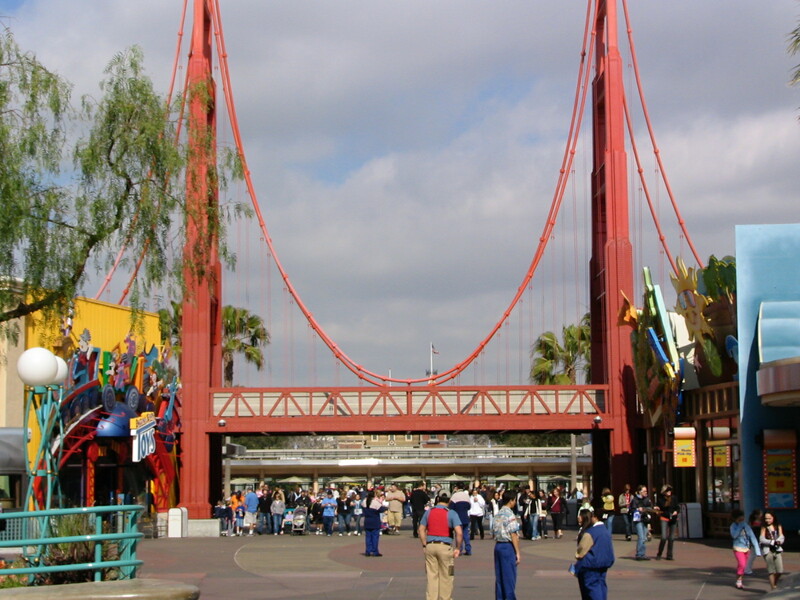 Years ago, I heard they were “imagineering” a ride that would take you through the San Francisco earthquake. How about a roller coaster with cable cars going up and down the hills, seeing everything shaking apart, the city falling down and burning around you? 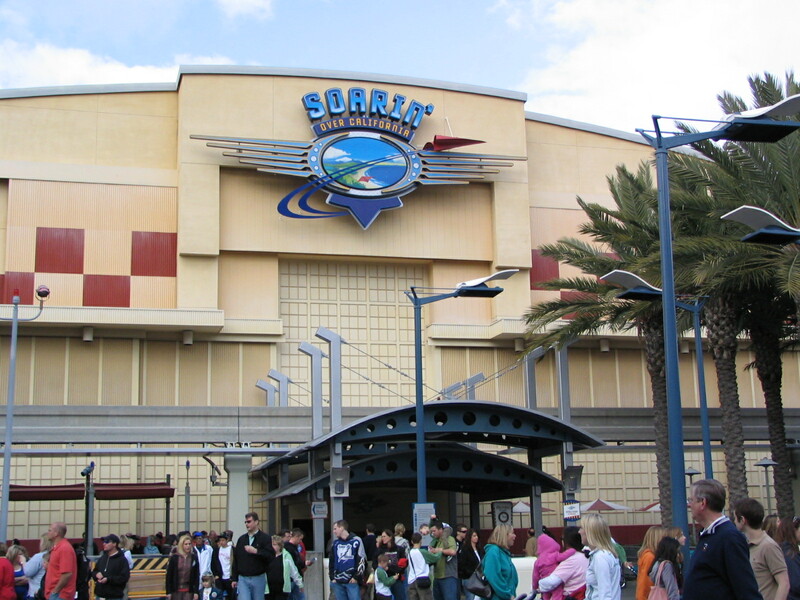 One project that seems pretty certain, as it was mentioned in the first articles where the park people said they had devoted a billion bucks to changing the place, is a ride based on Cars, the movie. That could be a thrill, too, a race-type thing. Or it could be a higher-tech Autopia, one of the most popular and venerable rides in Tomorrowland, and one that appeals to a younger audience. Get rid of the whole wine area. Wine, in Disneyland? Can’t you hear Walt moaning? When Disneyland Paris opened the French howled that there was no wine served there, and eventually park management relented. But that’s the French, what can you say? They’re French. 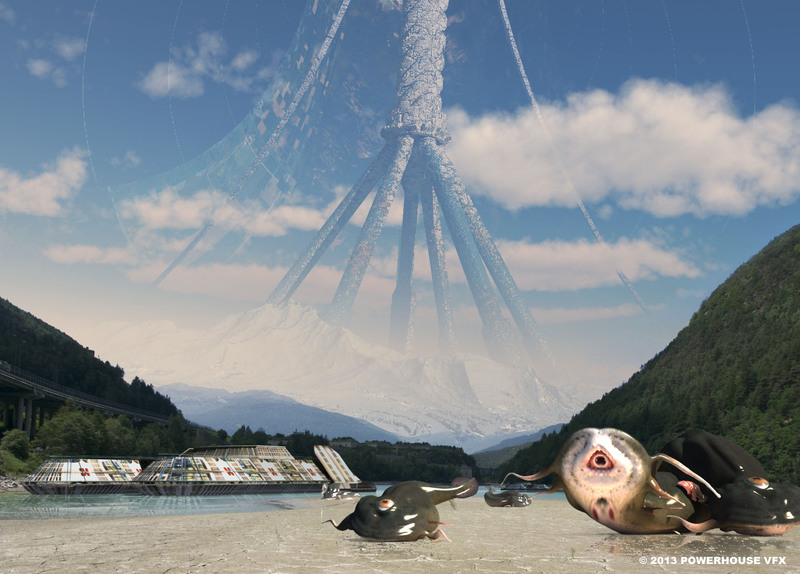 They probably eat snails over there, too, like they eat dried squid on a stick and sushi in Tokyo Disneyland. 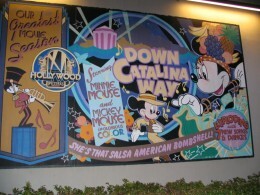 If American’s want wine with their dinner, they’re willing to go to Downtown Disney to get it. Get rid of the Mexican area. What they seem to do there, mostly, is make tortillas. Now how exciting is that? If you want to keep the south of the border idea, why not go way back, to 1944, to that old Disney episodic film, The Three Caballeros? It starred Donald Duck, a rooster called Panchito, and a parrot, José Carioca. That was one heck of a good film, and if the imagineers can’t come up with some good rides based around Mexico and Brazil, they better retire. 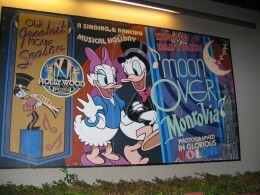 Donald has always been under-represented at Disneyland, anyway, where the much nicer Mickey rules. I have always preferred Donald, and his sense of anarchy and explosive temper would make him a good mascot for Disney’s Adventure Park. Or maybe even … Donald’s Adventure Park! So get with it, imagineers! Do I have to do all your thinking for you? 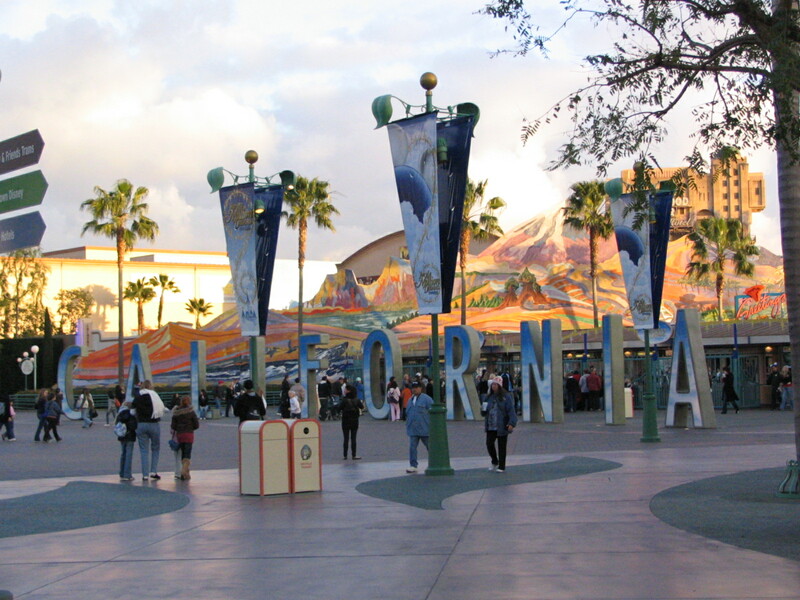 The first day we visited the California Adventure, it was decorated for autumn, like Disneyland was decorated for Thanksgiving and/or Halloween, depending on where you looked. They’d done a nice job of it, as usual, and the theme was cornfields, harvest time … only the corn on these cobs was candy corn. The big letters spelling out CALIFORNIA in the esplanade had been covered over with gigantic pieces of candy corn. The next time it was candy canes. Inside, we wandered around a while, listened to a really terrific doo-wop group on the street in the Hollywood area, and just missed getting into the big show over there, Disney’s Aladdin – A Musical Spectacular. 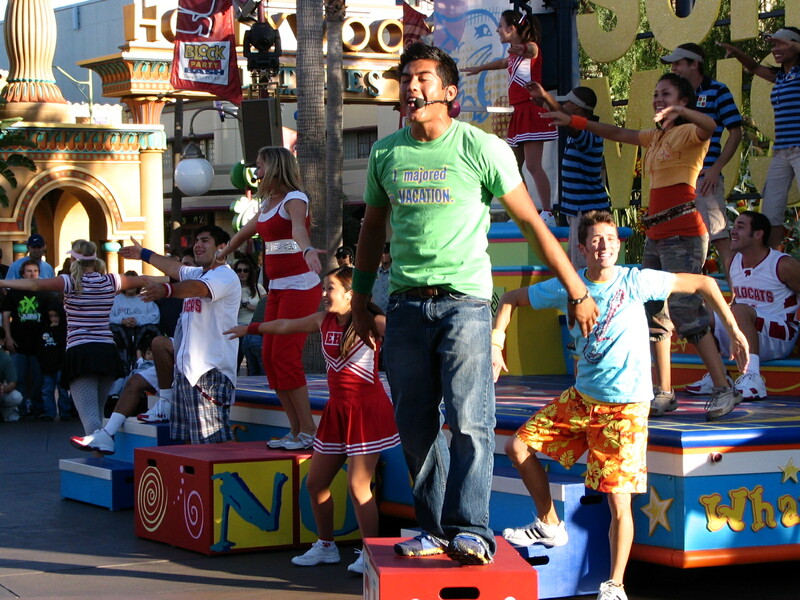 It was almost time for the parade—actually, it’s a “street celebration,” as the show comes around on one big float and the performers hop down and start singing and dancing their little hearts out. It was High School Musical 2: School’s Out! As always, the talent on display was of a very high level, perfectly rehearsed … and it was a little embarrassing, because the crowd was rather small. We had no trouble getting front row seats on the ground. Try doing that at the last minute for the Christmas Fantasy Parade across the way, and you’ll be looking over a sea of shoulders. Try it for the Electrical Parade, and you’ll do even worse. By the way, that venerable institution (first showing, 1972) now winds its way through California Adventure and is one of the main reasons for going there, but of course it is a transplant from Disneyland, brought back when millions of people threatened to lynch Michael Eisner and all the geniuses who axed it and replaced it with the “streetacular,” Light Magic, which cost $20,000,000 and lasted a big six months. 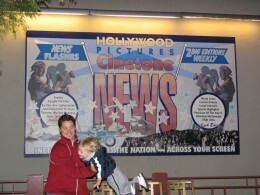 Our second trip to the California Adventure. A cool night, rain threatening. 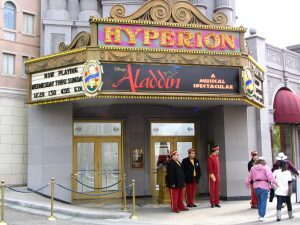 We saw it was almost time for the show at the Hyperion Theater. We made our way down the main street, where all the buildings are copies of real Hollywood landmarks, and are full of little shops with clever names: Award Wieners, Gone With The Chin (don’t know what that is) The Souvenir Itch. We made a detour to the backlot, and it was even less crowded than the last time we were there. Forlorn is the word. There are two shows back here: Muppet*Vision 3D, which apparently was open but with no takers, and Monsters, Inc. Mike & Sulley to the Rescue, which had a sign on it saying it was closed. For the night, or for good? 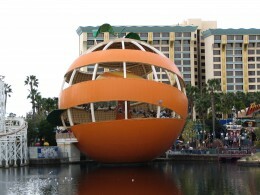 It’s still listed in the brochure as an operating attraction, but who knows? Why close it early? It’s not like it’s overwhelmed by crowds. 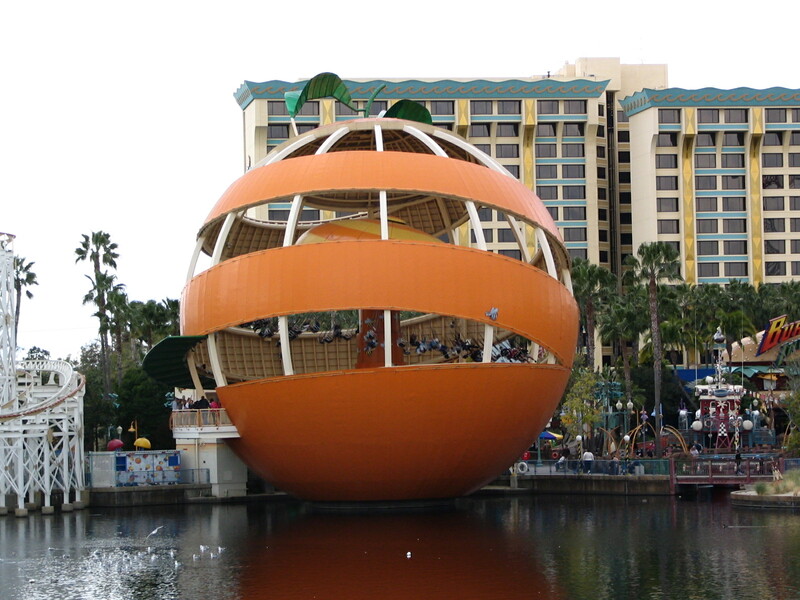 This is the ride that replaced the Superstar Limo ride, something that was apparently ill-conceived and lasted less than a year. For four years the ride was dark until Monsters opened. They repainted the original limos of the ride yellow to look like Monstropolis taxis. One of these vehicles is sitting outside, looking like the California Adventure equivalent of a beater up on blocks in the front yard of some one-eyed fuzzy monster redneck. Right next to it is a closed hamburger stand … with burnt-out neon! ICE COLD R HMENT. You never see a thing like that in Disneyland! Like Lee said, Walt would have howled like a banshee. Oh, well. Re-thinking is in progress. 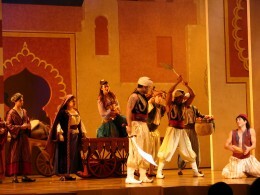 Inside, the theater is cavernous and ornate, a feast for the eyes. The seats fill up quickly, and the show starts soon after. We ended up in what I think were the ideal seats. There’s a section up close to the stage, then a wide aisle behind that where the elephant comes in, and stadium seating behind that. Each section is further divided by two aisles into right, left, and center. In the back of the left-hand section is a row of only three seats, and we grabbed two of them. This gave Lee a perfect angle on the stage for taking pictures. And yes, photography is allowed, but no flash photography, and of course no cell phones or pagers. They told us that at least five times. And still I saw a flash or two. The show is … well, what did you expect? Spectacular goes without saying. They pull out all the stops. Skillful and artful as well. Every part was well-acted. 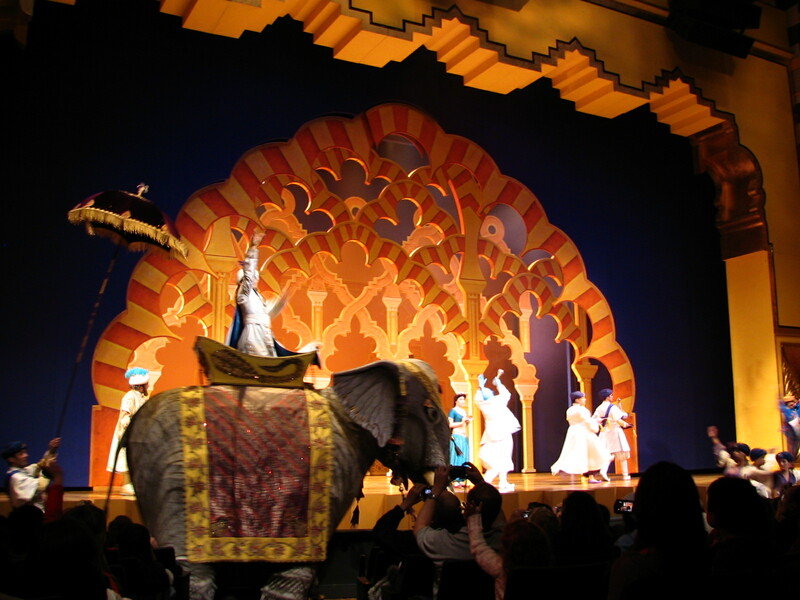 They even managed to animate the flying carpet, as they did in the movie, with a small woman acrobat tumbling all over the place. The nasty parrot, Iago, is a hand-held puppet manipulated by a visible handler, like in Avenue Q. Just about the only character missing from the cast is Abu the monkey. And just as in the movie, the star here is not Aladdin, who’s a schmoe, but the Blue Genie. The dude who played him was awesome. (The one thing I missed was a program, naming the cast. These people were too good to perform anonymously, like Disney characters strolling the park for photo ops.) As you may recall, Robin Williams vamped a lot of his dialogue, and the best parts were used in the movie. There were impressions, movie quotations, witty asides, jokes galore. This fellow not only had to do all that stuff, most of the time he was doing a damn good impression of Robin Williams doing them. He was great at the physical comedy, too, no small thing when you consider that the genie in the movie was capable of doing anything, transforming himself, flying, moving faster than any human could. 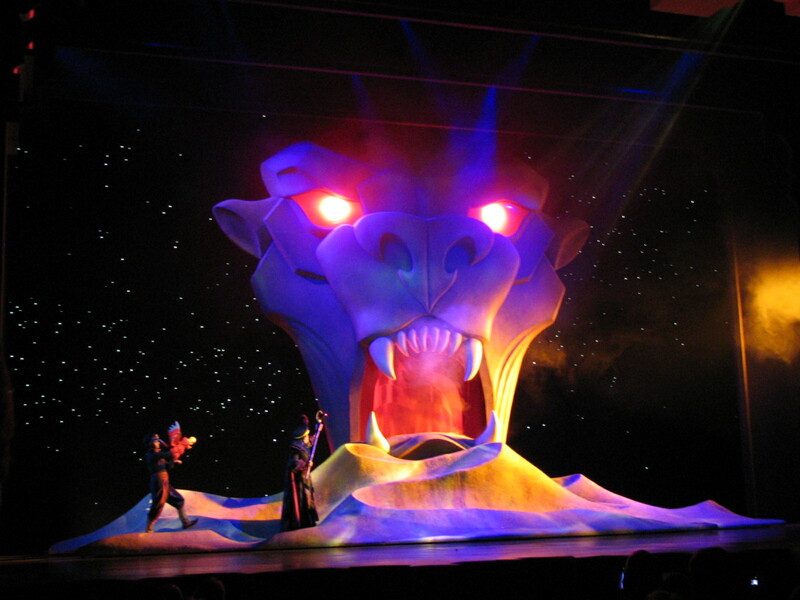 In this show, at one point we had about a dozen genie clones dancing up and down a staircase. There were topical references, too. 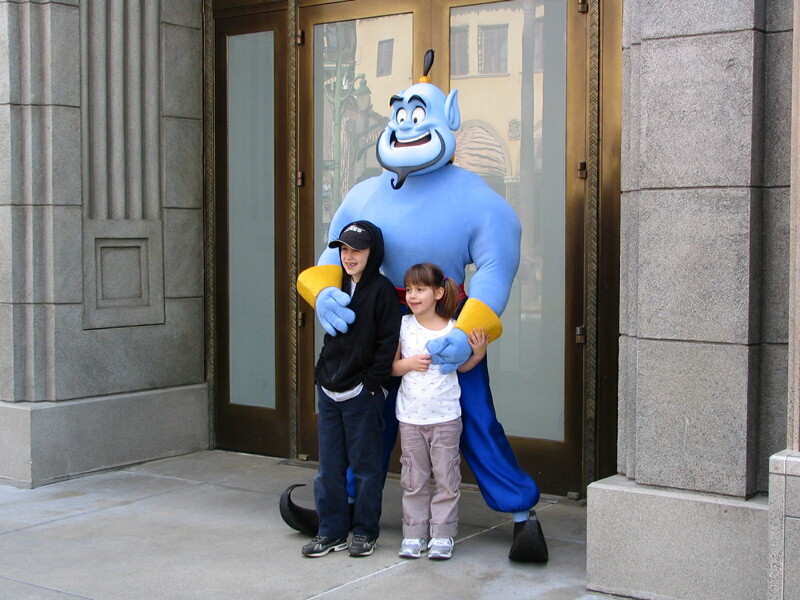 At one point the genie pauses, says he doesn’t have a line here. “I sure wish they’d settle this writers’ strike!” The show lasts a little less than an hour. 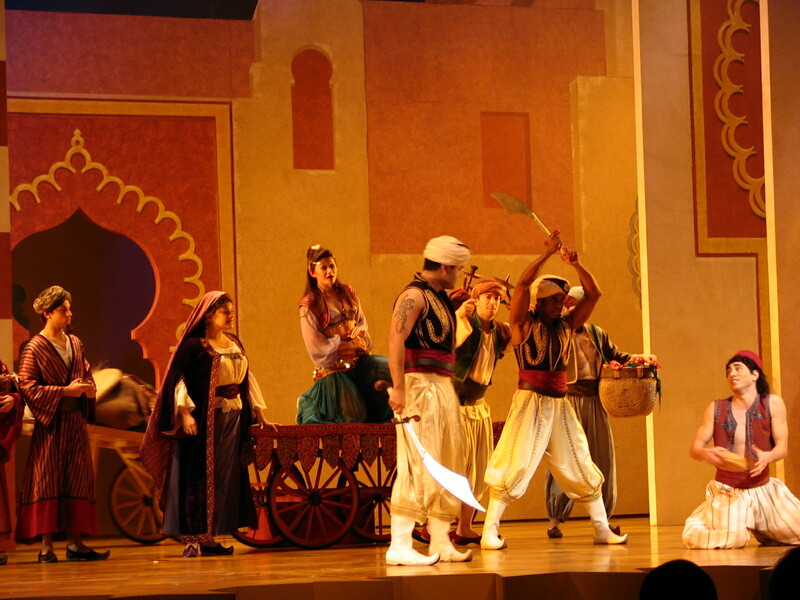 One interesting observation: Though everyone was smiling and having a great time, and it was clear they were enjoying the show … I saw a lot of people who weren’t clapping after the big musical numbers. I don’t think it was that they were rude, or unappreciative, believe it or not, I think they just don’t go to Disneyland with the mind-set for clapping. Think about it. In 95% of the attractions, you see the famous audio-animatronic robots. Why clap for them? They’re just mannequins, controlled by computers. I even wonder if some of the people there weren’t sure if these were real people up on the stage. Weird, huh?